Truly one of Northern Wisconsin's most impressive get-a-ways. 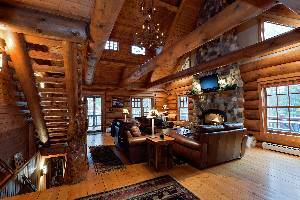 This breathtaking handcrafted log masterpiece is located on over 600 feet of gorgeous peninsula frontage on Catfish Lake, the most prestigious of the entire 28 lake, Eagle River Chain of Lakes, which is the largest inland chain of lakes in the world. Relax on the professionally landscaped grounds, including a rippled sand swimming beach, while observing fabulous views of beautiful Catfish Lake and its three tranquil islands. This incomparable park-like setting is picture perfect and very private, with water on each side of the property. 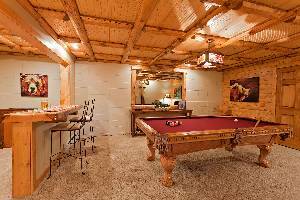 Enjoy the exceptional quality of this stunning hand-scribed full log lodge, meticulously hand-hewn from massive northern pine logs. Lavish in the fabulous luxury amenities at this 4,200 square foot, one-of-a-kind home. 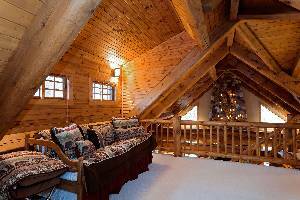 The expansive full log beamed ceiling will leave you breathless. With uncompromised quality throughout the 4 bedrooms, loft, billiard room, 3 bathrooms, fully equipped kitchens, laundry room, decks and patios, row boat, swing set, and even more amenities then can be listed here! The western, northern, and eastern exposure will give you incredible sunsets and sunrises. This exceptional vacation home sleeps a maximum of 12 people. For more information visit: www....com/ivl. For more information visit the website: www....com/ivl. 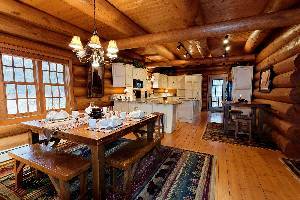 Thank you so much for the use of your beautiful lodge. We had a great, restful time while enjoying the peacefulness and beauty of the lake. We really appreciate your thoughtfulness and kindness. We loved everything. It was great! We really liked your decorating! Your home was very beautiful! We were very impressed by the house and the property when we got here. We had great campfires at night under the gorgeous night sky. We saw at least 3 shooting stars! The pontoon boat was tons of fun. We really enjoyed motoring around and exploring the chain of lakes. We also tried some fishing. Overall, we enjoyed our stay immensely. It was a great weekend to get away and spend time with our friends. We would love to come again, and hope to book a stay real soon! What a wonderful time we had again! 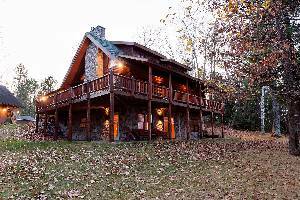 We love this home and look forward to our return! This was a beautiful home to come and stay in. We came up to relax, fish, and snowmobile. It was perfect weather! It snowed almost the entire time we were here which was perfect for snowmobiling! We caught about 20 perch ice fishing. We took a walk around the island and that was lots of fun. The home here is just perfect. We had such a wonderful time and enjoyed the home so much we are already planning our trip to return for next year with more of our friends and family. Thank you so much for everything! New Year’s 2007! 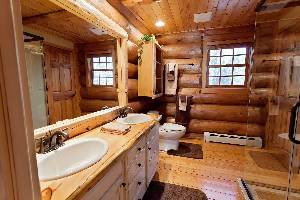 Thank you for sharing your beautiful log home. We enjoyed the whole package. Time with family and friends was priceless! Esta cara foi muito acolhedora. Obrigada pilo Natal maranilhon que passamos aqui. Feliz Natal. Merry Christmas! We had a great time with family and friends here. It was nice to spend Christmas in a log cabin and a white Christmas. Everything was fantastic. We would definitely rent this house again during the winter and maybe try the summer too! Beautiful house! Wow! What a beautiful place to celebrate our 1 year wedding anniversary! Your home exceeded our expectations! It’s absolutely beautiful and the location is heavenly! We did a little fishing, some exploring, shopping, and a whole lot of relaxing! Who knew doing nothing could be so fun!! It was great to get away from it all for a few days to such an amazing place! We played a lot of pool; I think my husband let me win twice, just enough to make me think I’m “good”! We definitely hope to return- maybe with our families!! Thank you so much for sharing your slice of heaven with us!! This has been one of the best vacations. The place was beautiful. My son-in-law surprised us by bringing us to share this family vacation with my daughter and granddaughters. The weather was great. My daughter and I tried canoeing, but ended up in the lake with clothes and all! We went horseback riding with the grandchildren. A good time was had by all. The place is great! Deposit: For more information visit the website: www....com/ivl. Cancellations and Refunds: For more information visit the website: www....com/ivl. 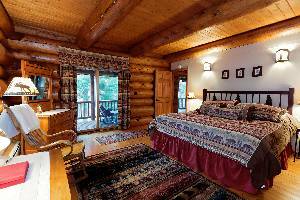 Other Fees: For more information visit the website: www....com/island-view-lodge-rates.